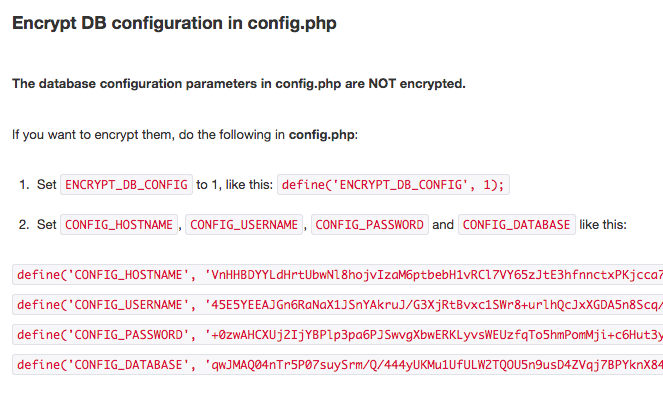 Since version 2.25.45, the database parameters in config.php can be used encrypted instead of in clear text. This way, if someone not authorized gets access to the config.php file, he won't be able to open the Team Password Manager database. 1. In Team Password Manager, logged in as Admin or IT, go to Settings and then Encrypt DB Config. 3. Also in config.php: delete the lines with the defines of the current db parameters (CONFIG_HOSTNAME, CONFIG_USERNAME, CONFIG_PASSWORD, CONFIG_DATABASE and CONFIG_PORT if you have it). Save config.php and reload Settings | Encrypt DB Config. You should see a message explaining that the db parameters are encrypted.